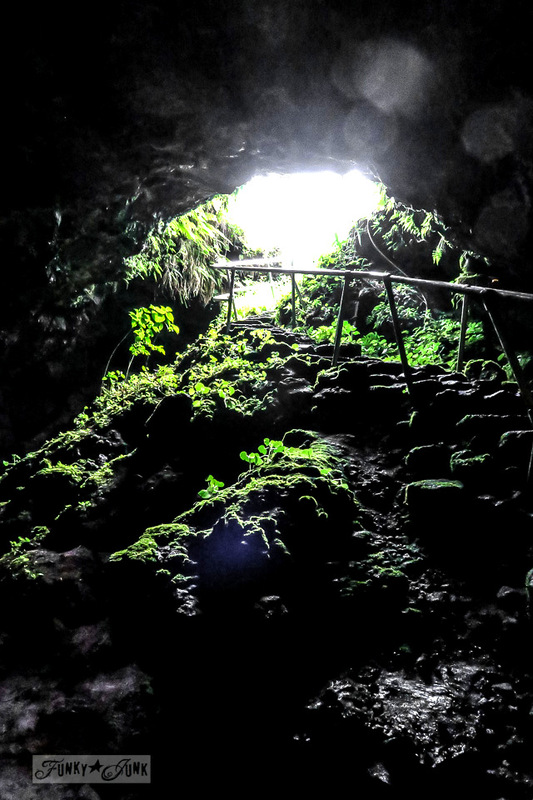 So… I plan a quiet trip to Maui, and thinking it will be a little too quiet, include a new-to-me romp over to Lana’i for a new adventure. That part’s coming soon. It’s a GOOD ONE. However, what actually transpired once I got here was so vastly different, I would have only labeled it dream material. My sister goes to Maui every fall, however they’ve seen so much of the island, they now just love to hang out by the pool and beach with their friends they also see. Well! I have NO idea how she knew Hana was on my big-time-bawling-my-head-off bucket list but she did! 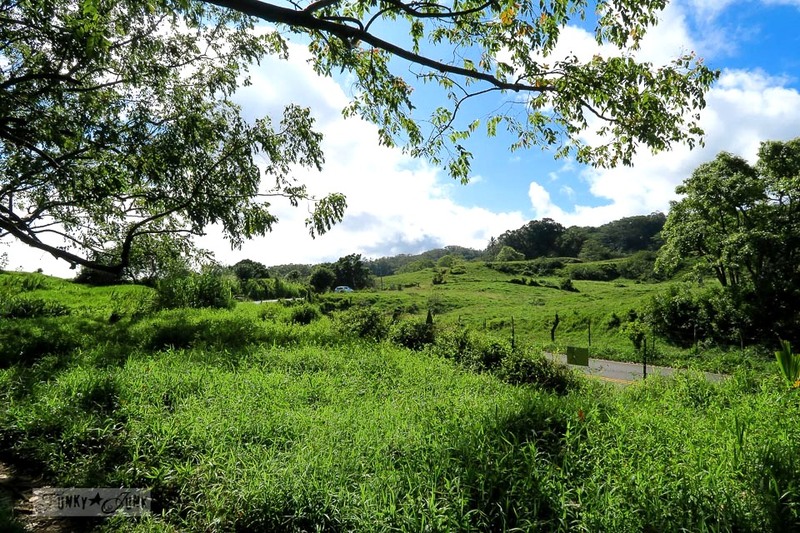 Wendy had gone to Hana years ago, however the roads were poor back then and they drove it in one day. If she was gonna do it again, she wanted to do it right… with me. For a family that always argues over who’s paying for dinner, I decided to zip my lip and accept! So we discussed both our expectations. We’d make it at least a 2 day trip if not 3, and make so many picture stops mom-style (our mom always wore a camera up to her face), we’d wear out the parking lots. Deal? Deal! So I quickly looked online and found a fab B&B off VRBO, booked one night, and we hit the road 2 days later! I prepared. Oh did I prepare, and prepare some more. I had the handbook The Ultimate Guide to Maui in one hand, and several maps in the other. I read the book word-for-word by the pool, and wrote 5 pages of notes about Every. Single. Thing. there was to see. The front office even loaned me one of those CD tours. Since we decided to stay 1 night, we knew (ok, the book said) it would be best to bring all our food for the 2 days of travel. So we raided our fridges and packed a cooler full of sandwiches for lunch, 2 steaks and potato salad for dinner, cereal and fruit for breakfast, and snacks to keep us going. AND good coffee with real cream and sugar. This entry deserved a sentence all on it’s own. Best thing we did was bring a huge jug of water to top off our smaller water bottles along the way. Another good thing was Wendy’s little pack she found in her condo. It was like a travel purse that held her camera and worked as a purse, with space for the water bottle. I did bring a big backpack, but reasoned it would get to clunky and heavy, and ended up just wearing my camera bag as a purse and carrying my water. But Wendy’s set up was better as she got to be hands free. So with good hiking shoes, bug spray and sunscreen intact, off we went! We first stopped at the car rental place to put my sis on the list to drive too, however since I was using my own insurance, we couldn’t check if they’d cover her as a driver as the office back home was closed. Bah. Something to check on next round. So… I just resolved to drive 100% and Wendy would have to try and read my 5 pages of chicken scratched notes glazed with sunscreen from around the pool and 20,000 crinkled up written all over maps. 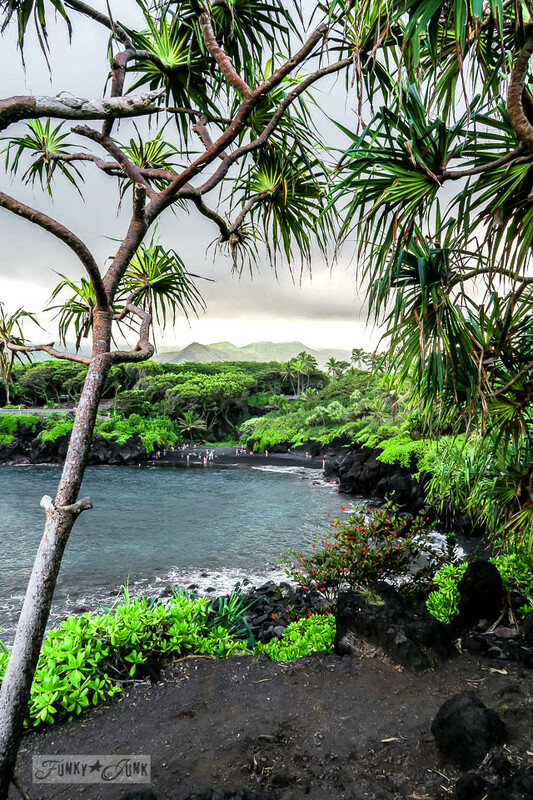 See if the condo’s front office has Maui Revealed – The Ultimate Guidebook (Amazon Affiliate Link) you can borrow (ours did), and take plenty of notes prior. Collect several different maps (that helped) and circle the hot spots. 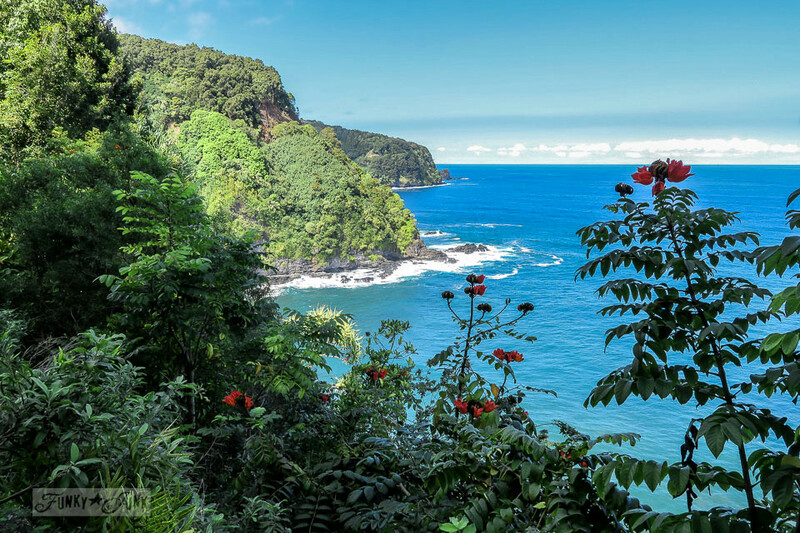 Book at least one night near Hana. Two would have been better. Check your car insurance prior to see if you can share drivers. Start with a full tank of gas. 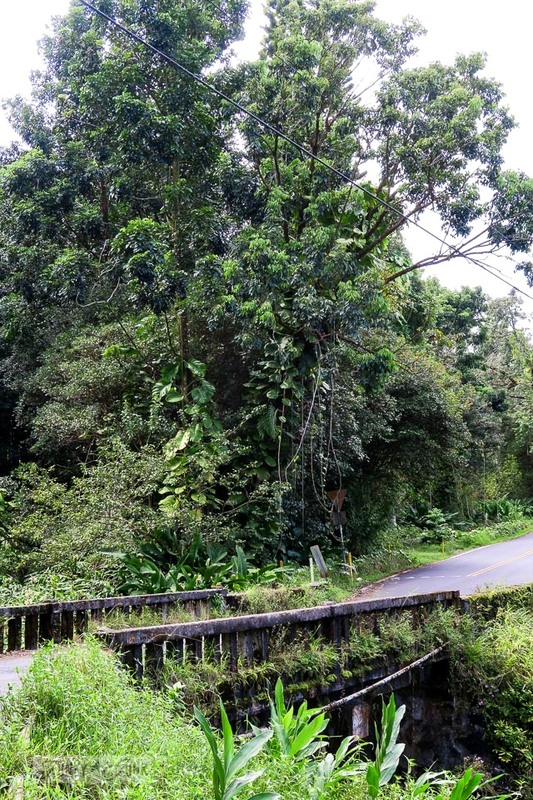 Plan to also gas up in Hana if you wish to play it safe. 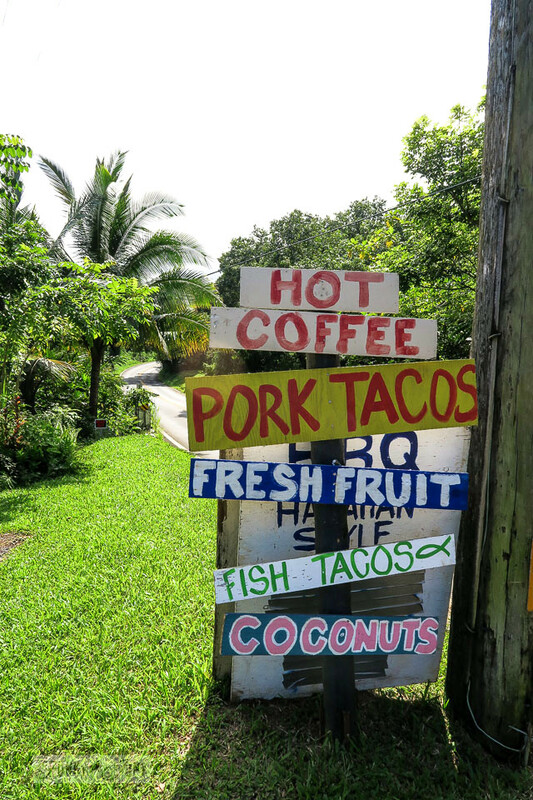 Bring all your food and drink so you can focus on your travels. Pack a large water jug to fuel smaller water bottles. Wear decent walking / hiking shoes. Pack along a water resistant smaller travel bag with an over the shoulder strap that can hold small camera, phone, water bottle and credit card / cash. Much more convenient than a back pack you have to keep removing. The first place of interest was Twin Falls. I had seen it last time I was out here so we passed it by this round, reasoning could either catch it on the way home or visit it another time as it was nearby. I vote to save the time for the farther away big guns myself. However it was this area where things started to get so jungle like! While the road has vastly improved over the years, it still resembles a race track, sharing exactly 59 one lane bridges and 620 hair pin curves. So whenever there was a pull out, this camera totin’ driver used one! Who cares! 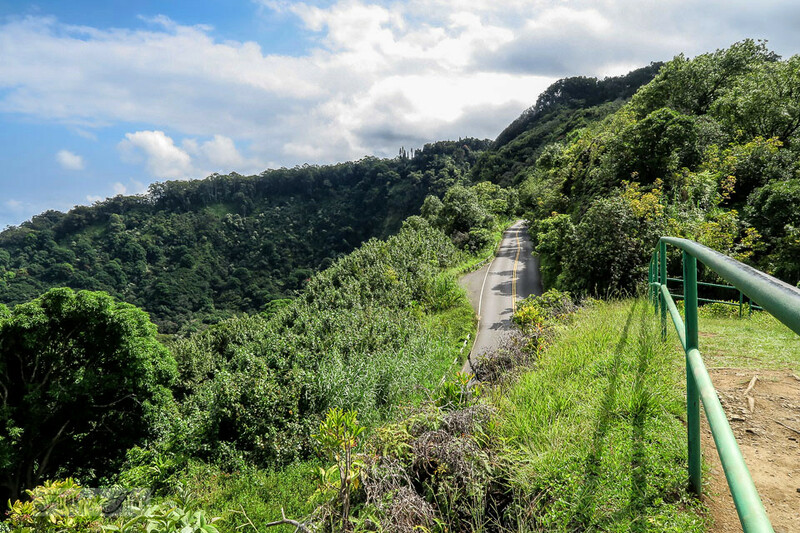 I was on the Road To Hana! Side note: I also used the pull outs constantly to let people pass. It’s better to follow them so they can make the call on when to cross the one lane bridges. Then all you have to do is follow suit. The book suggested to try and drive by yourself though. The book was right. On the way there, we pretty much had the road to ourselves and it was FABULOUS! And then we saw them. 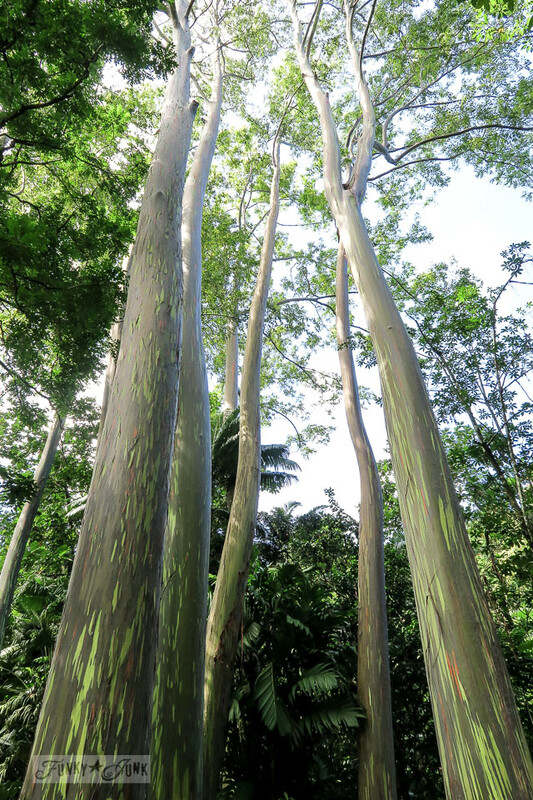 The infamous rainbow Eucalyptus trees! They didn’t even look real. Just spectacular. The colours are created by different layers peeling away. So gorgeous! For those not having traveled this route, you’ll find this part helpful. The entire way is marked with mile markers, making it relatively easy to know when there was something to see when referring to a map or a CD playing. Then again, some points of interest were only spotted via parked cars. So it’s a bit of a crap shoot if you are looking for something in particular. Best thing to do is stop where others stop so you know why they stopped. I’m not even going to pretend to remember the name of every stop and lookout. However, it really did pay to investigate if you spotted one. You never know what kind of view you will have. So, here’s a tip on how to park where. Quite often you see cars parked in front of no parking signs. This is because Hawaii isn’t best known for explicit instruction. So if you see a bunch of no parking signs near a pretty sight, all they say is don’t park. But they neglect to tell you parking is just ahead, which would be more effective. So (ahem) people park illegally because they don’t know if they’ll get another chance to see a particular waterfall. Which actually causes mayhem in front of one lane bridges. There was a little climb to the right of it if you wished to go on top and beyond. Our day was perfection with no rain. Even so, I hit a little mud so I turned back. There’s another taller falls if you keep going. But let’s just say, good footing was more important than risking a broken neck. 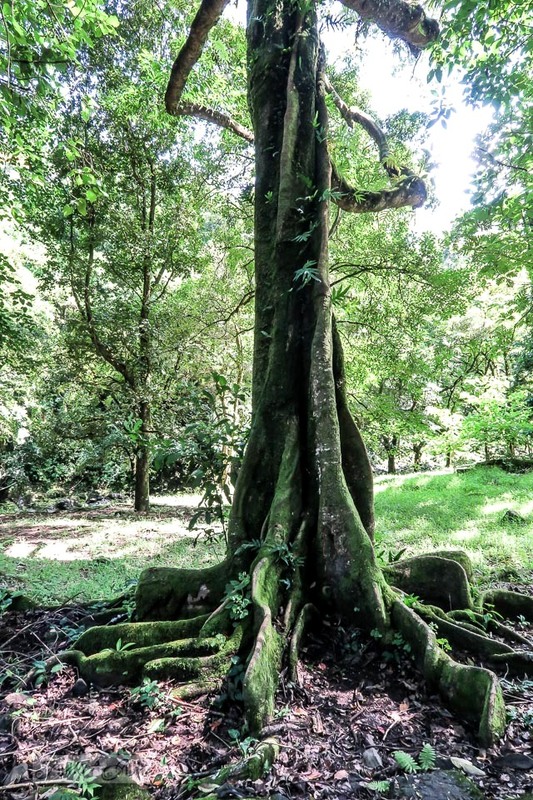 The pathway was positively infused with roots making for a difficult climb. Many attractions on maps are also on private land, so it pays to know where you are welcome or not. This was rather neat. 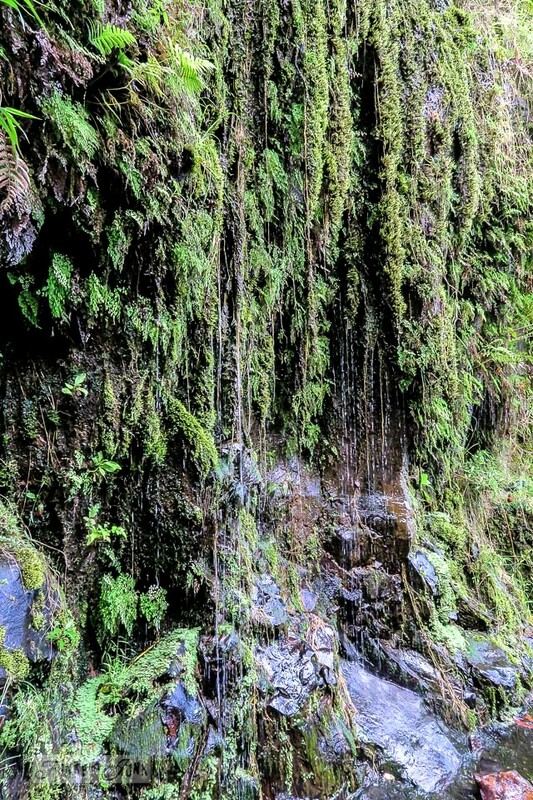 It was like a moss filled water fall on the side of the road. So pretty. You really were treated to some spectacular sights without leaving the side of the road. Now this was an interesting stop. 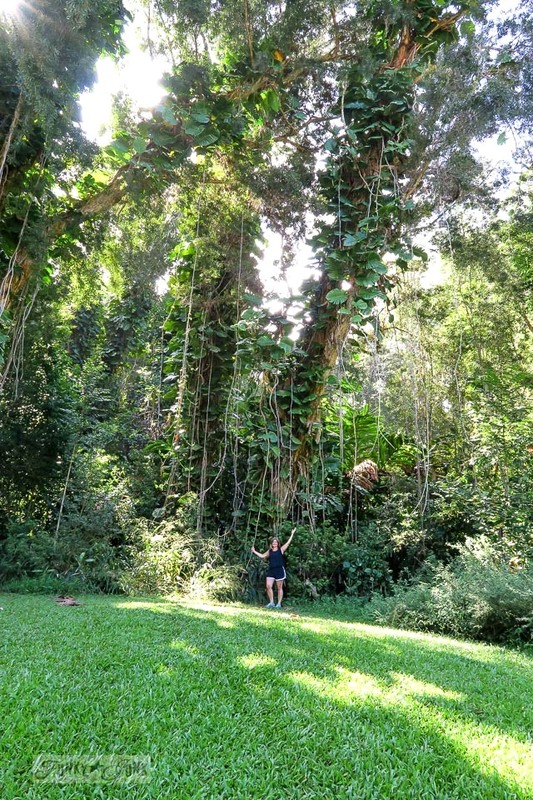 It’s called Keanae Arboretum Nature Trail. 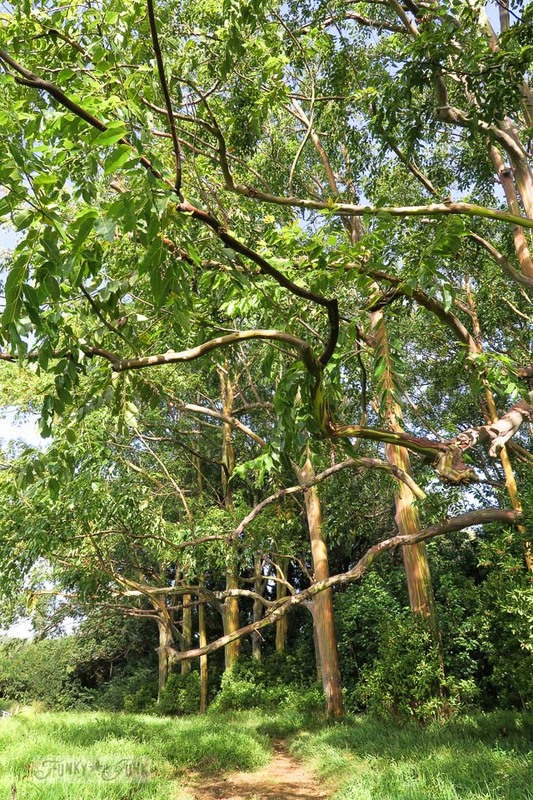 It’s a six acre arboretum and botanical garden you can easily walk along a smooth flat path. So while the plantings are man made, the species were incredible. I truly wish this I could have captured this meadow the way I saw it. It was electric green, lit up by the sunlight. It was like something out of a storybook. It was a lovely change of pace from climbing mud infested roots and dodging curves on the road. 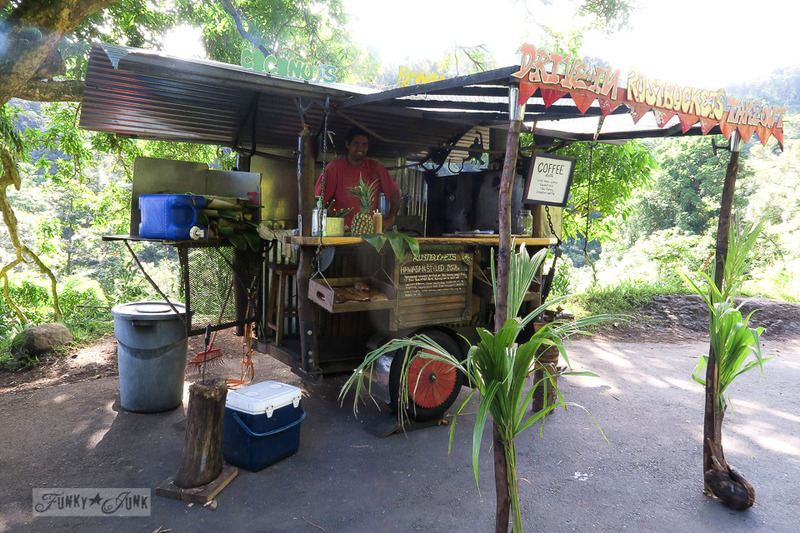 As we inched our way towards Hana, we did find some road side stands here and there. Next round, I’d stop at this stand above. He was serving a rice and shredded pork dish on a banana leaf. It looked so authentic and delicious! However, we were good girls eating our sandwiches (darn it anyway) and kept going. 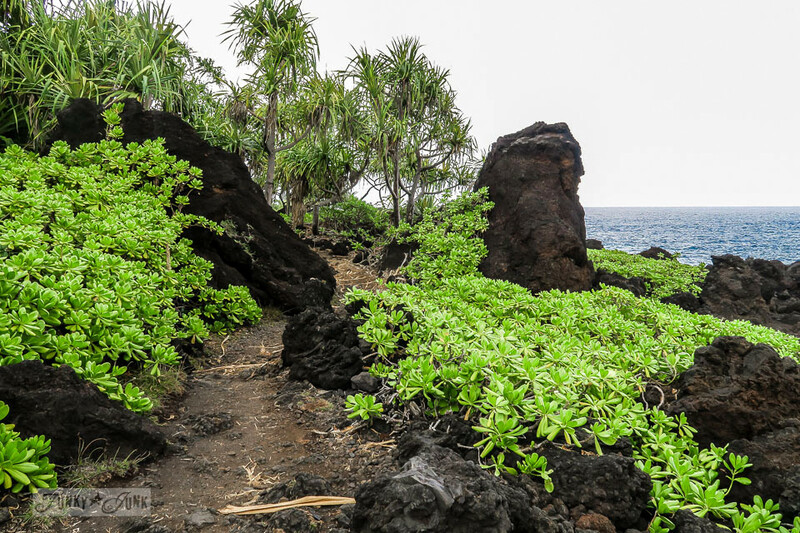 I believe this area was part of Pua’a Ka’a State Wayside park. We didn’t investigate much, however by the looks of it we may have bypassed a waterfall. Whoops. Some waterfalls you had to work for, and others you could see from the road. We were starting to get tired, so if we could see water from the road, we were all over those. But the hidden ones, not so much at this stage of the game. It’s honestly IMPOSSIBLE to see it all in one day, let alone 2! You start to lose power and become jungle drunk, not even seeing how beautiful the area is any longer. So if I had known what I do know now? 2 nights minimum would have been a must. Longer would be even better. But be sure to go with a true adventurer that wants to stop at every little thing. Because after all, that’s the whole point of this trip. 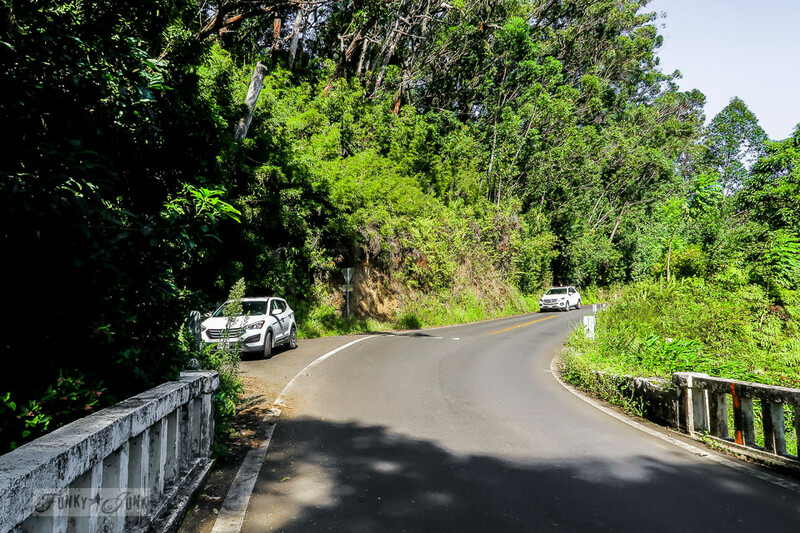 The most magnificent part of this drive is never knowing what’s around one of the hairpin curves. 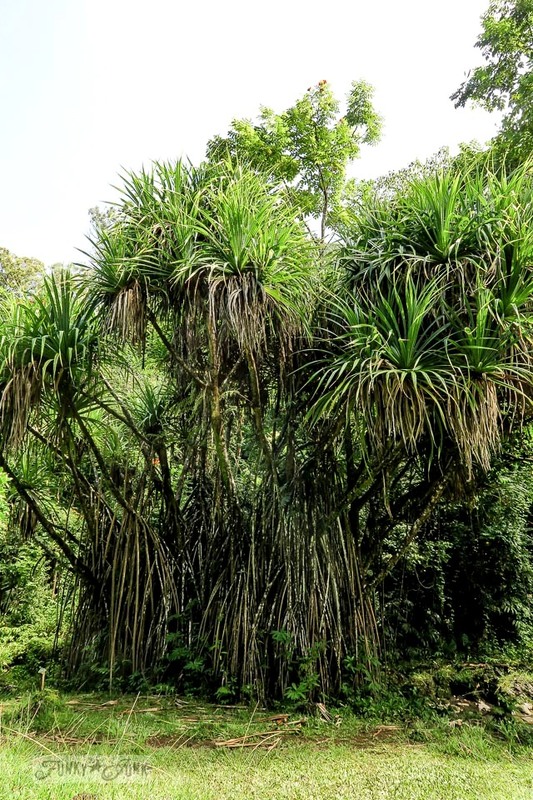 You may end up seeing a jungle showcasing the tops of a bamboo forest (spectacular sight!) a plunging waterfall, or a beautiful ocean scene. This drive gave it all to you. But my personal favs were the old single lane bridges. I stopped whenever I could to look back on one. And am I ever glad I did this round. Otherwise I would have missed this! 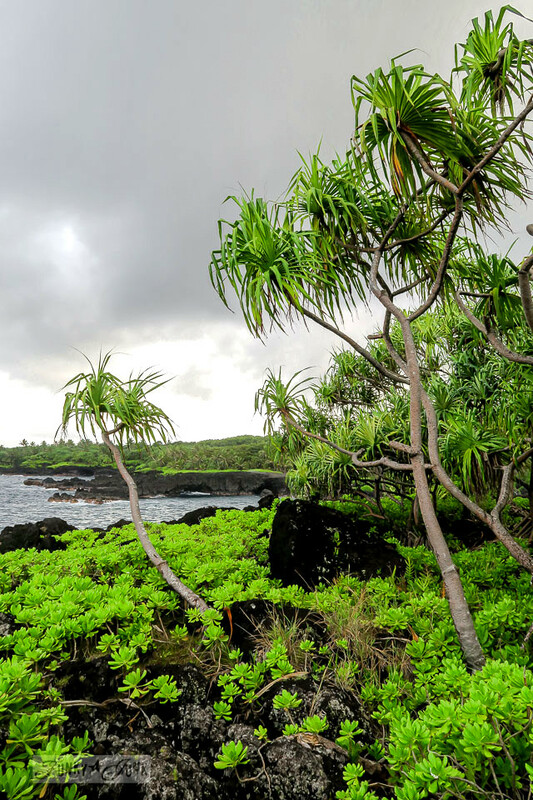 At this point, we hit the Nahiku area where our overnight stay would take place, a short 15 minutes from Hana. I’m going to tell you more about this area in day 2. However I will say this. 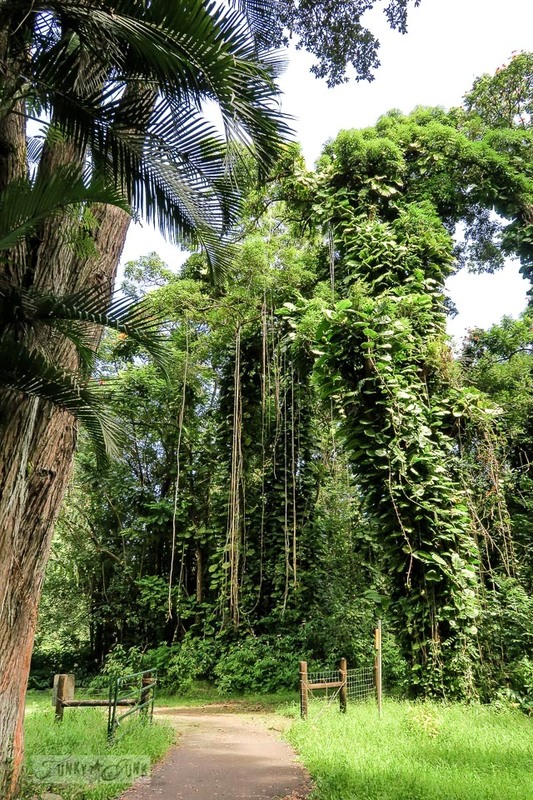 It IS the prettiest place on Maui, where the jungle appears to be the most dense. I am SO GLAD our cottage was right smack in the middle of it! So we found our place which was just off the main highway (easy! ), unloaded our groceries, then head out for 2 more stops ahead before we called it a day. 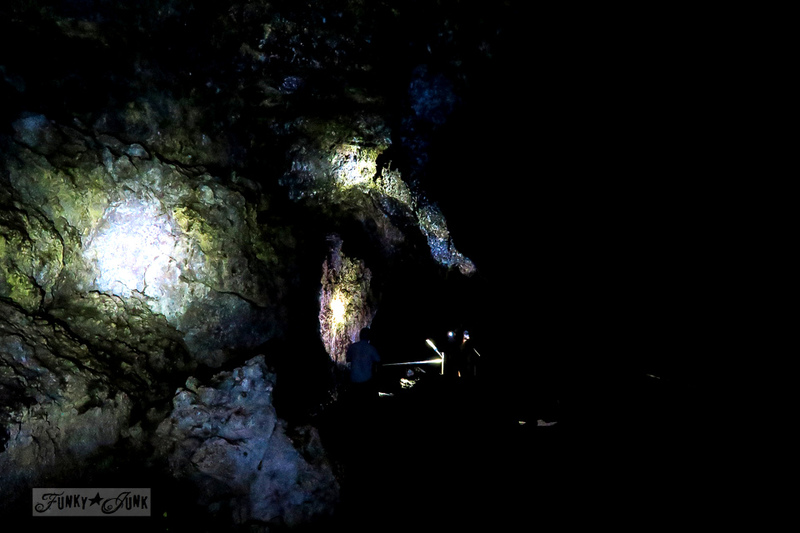 The Lava Cave Tour was a pretty good stop. 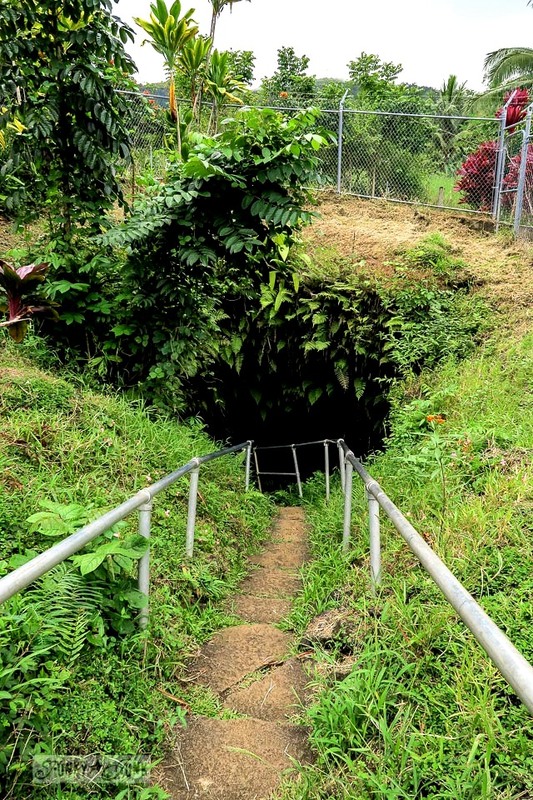 Set on someone’s property, the steps led down into the ground, showcasing a very long underground lava tube with so many different types of surfaces. Some of the walls looked like dripping chocolate! 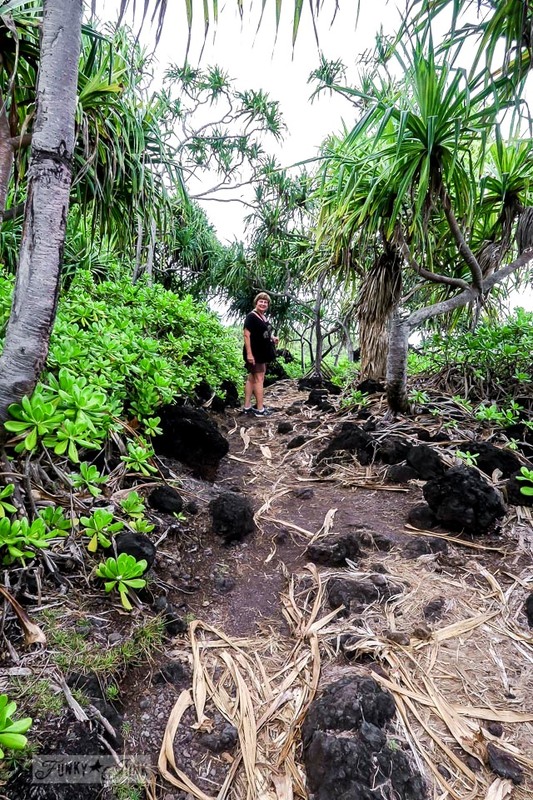 Pretty cool if you’ve never done a lava tour walk before. And because it was pitch black inside, this is the best I can offer. They outfit you with flashlights and off you go. And there was one more stop that we HAD to take in before night fall. 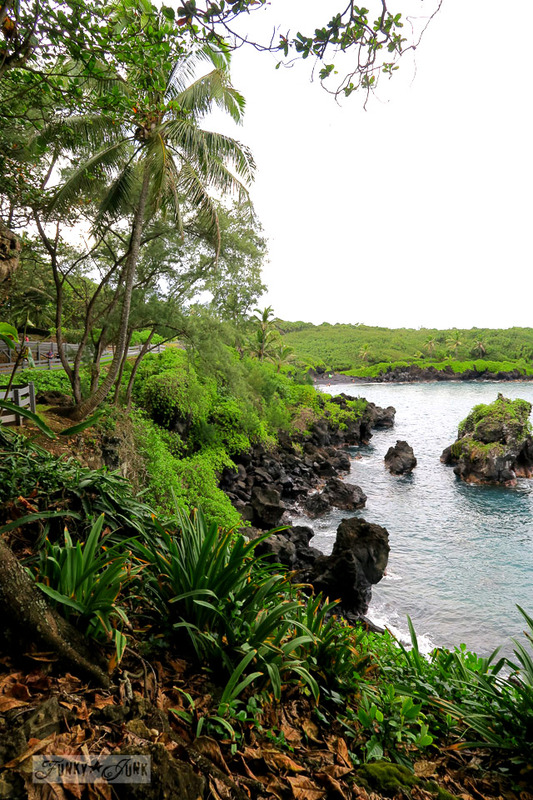 And if you’re going to speed to Hana and back again in one day, put this on your MUST STOP LIST. 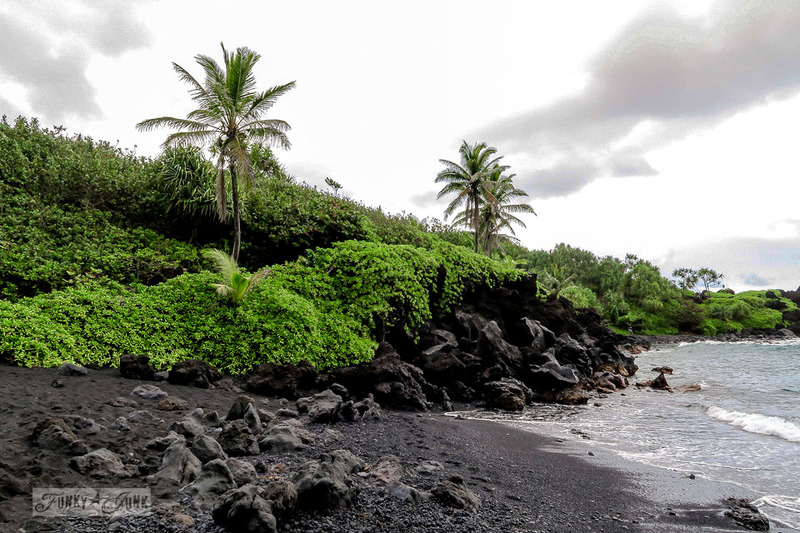 This is Waianapanapa State Park, home of the famous black sand beach. Get ready to DIE. This place was like walking onto a movie set! It was Gilligan’s Island perfection! 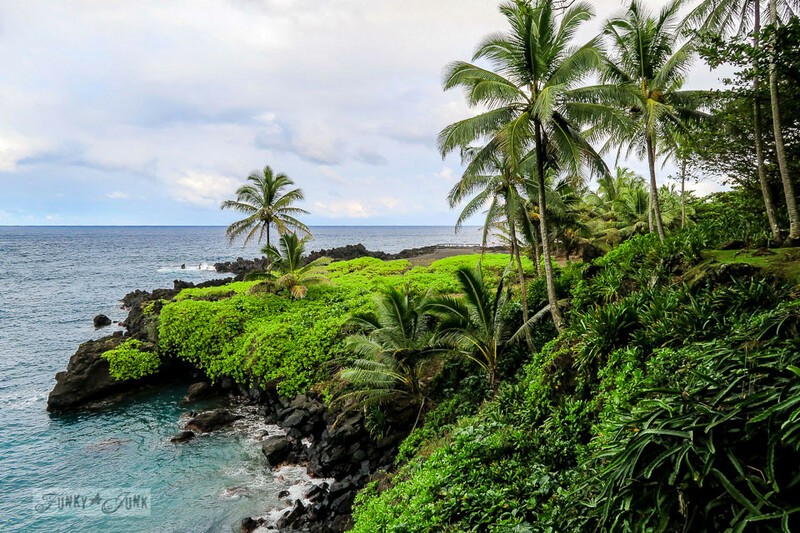 The depth of the black sand against the lush green, set against the aqua water had you flat out spellbound, stumbling for words. Isn’t this just so spectacular? Along the other side of the beach was a long and winding walking trail we had to inspect. I mean, the black against the green… the sheer natural beauty made you want to cry. This place didn’t even look real. It’s safe to say, this last stop was the perfect way to end such an incredible perfect day. 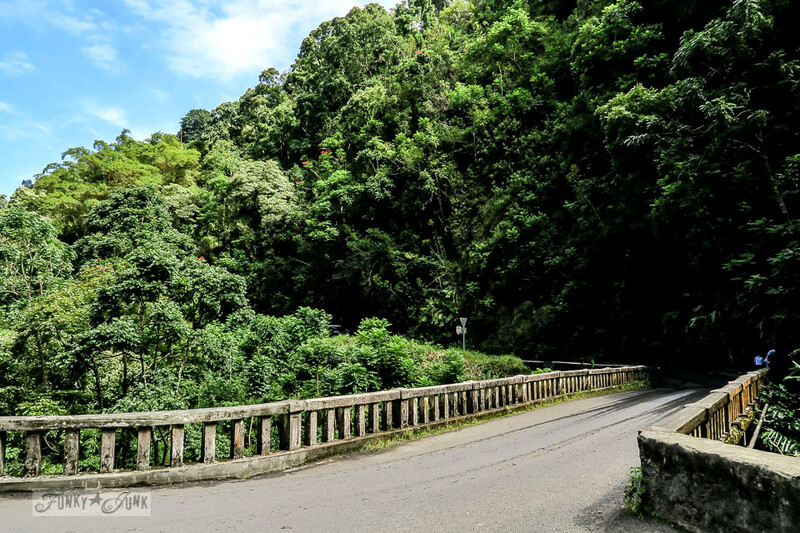 That charming tour and the famous bamboo forest hike from the Pipiwai Trail are part of Day 2… stay tuned! 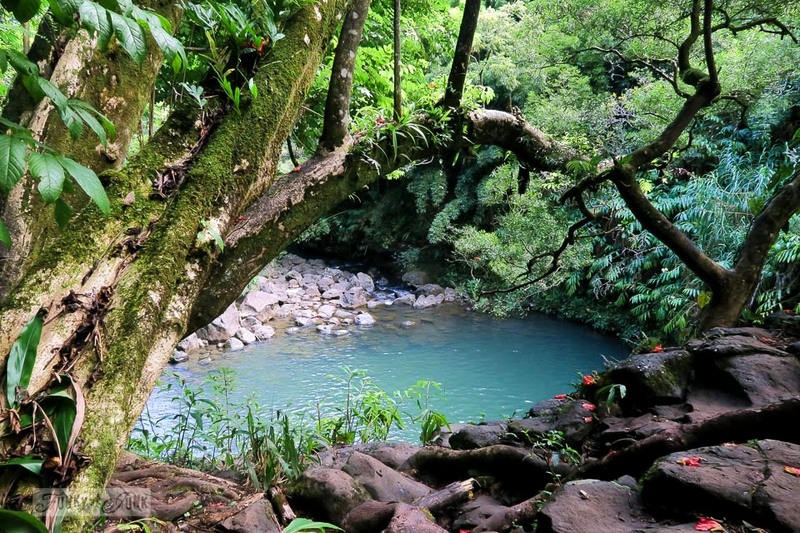 Have you been to Hana? What was your fav part about this tour? Would you do anything differently? WOW what a day you 2 had. 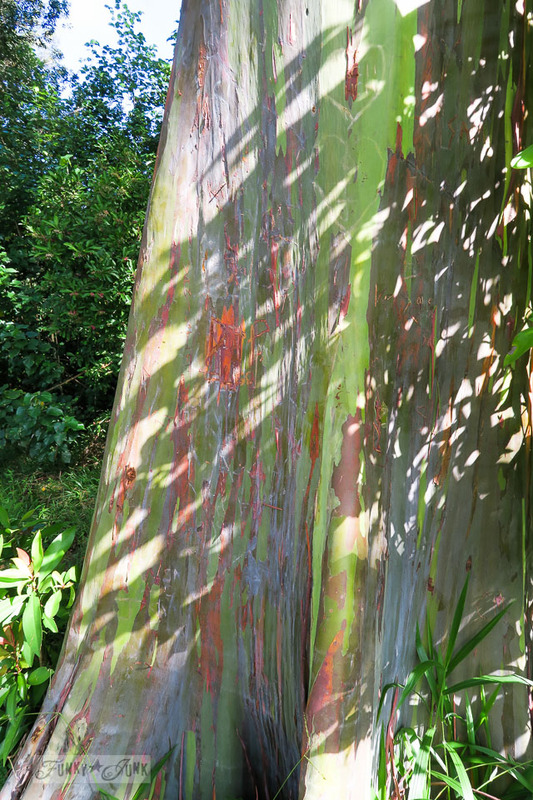 Loved the contrast and the rainbow bark. But as soon as I saw the smooth black shiny stones on the beach, I immediately saw a pendant wrapped in silver wire. Thanks for sharing. Ohhhh, that’s a lovely vision Melissa! Our day… TWO days was pretty over the top wonderful! Haha, well, if it’s your first time Moriah, the best advice I could offer you is, stay long enough to see the stuff you want to, however time to do nothing as well. When I did a fast 8 day tour to Kauai, I ensured I could have a beach day every other day. It really helps and is something most folks don’t take the time for. WOW! The landscape is beyond gorgeous! Those luscious greens and the the waterfalls are just spectacular. Your pictures are real eye-candies. Thank you, Donna! Loved reading about your adventure. I went to Kauai last December for 8 days. I stayed in a house with 5 other travelers. We had a local tour guide who knew to have us pack lunches/water & provided walking poles for us. 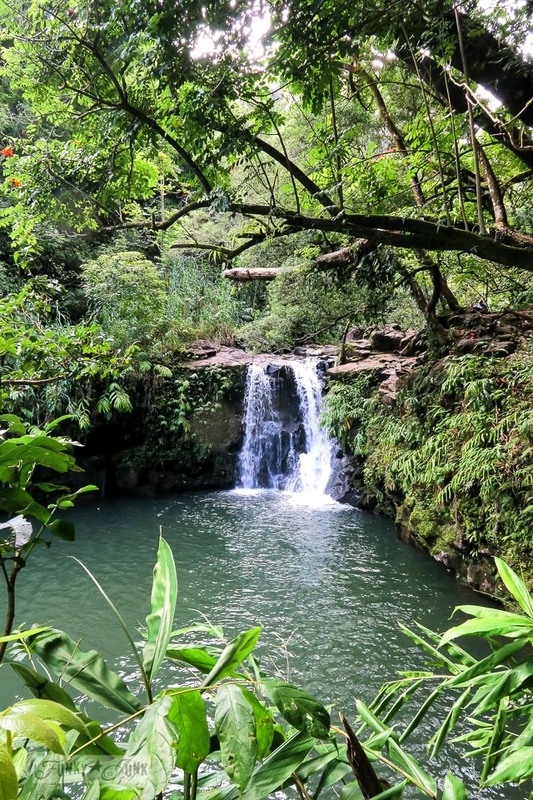 It seems like Kauai is very similar to Maui in that it has tons of hidden, cool spots, waterfalls, unique vegetation, hidden caves, great hiking venues and unbelievable views. Your pictures and descriptions made me feel like I was right back there! We went to one tall, hidden waterfall off the beaten path. You first traveled by kayak, then hiked, walked through a river (thigh-high water), hiked some more; and ended up at the bottom of the waterfall were people went swimming. It is sooo different in Hawaii. A place highly recommended. And the whole mood of Hawaii is so laid back and relaxing. I WILL be going back. Can’t wait to hear more about your trip! Hey Mary, your tour sounds amazing! I would love to do something adventurous like that. 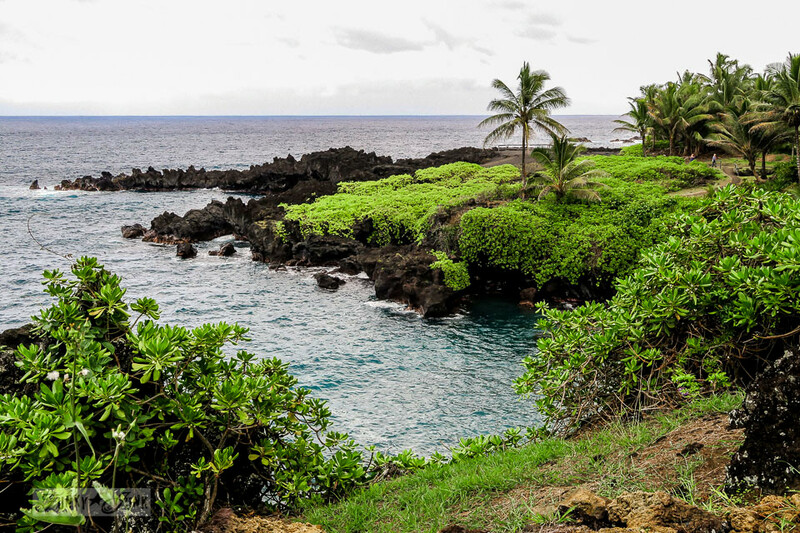 The Hana side of Maui is actually very similar to Kauai, however I’ll even admit, nothing quite compares to the North Shore of Kauai! Every turn is so overwhelmingly spectacular! 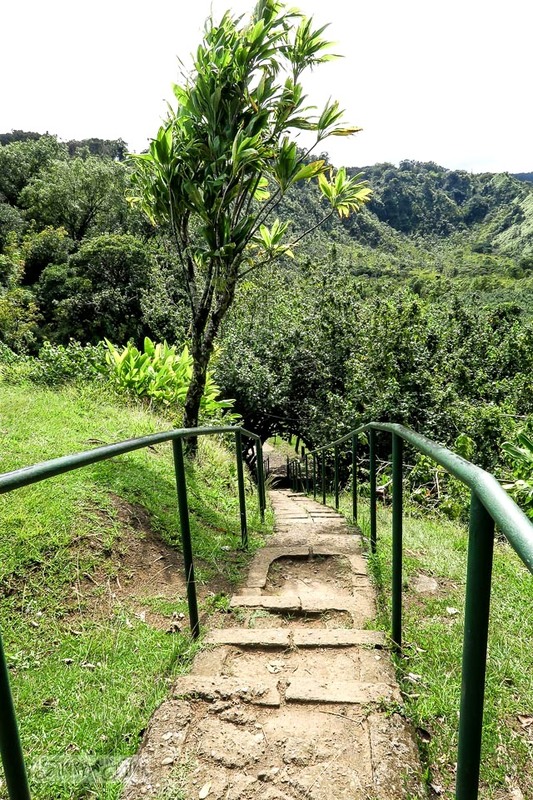 I’ve never been to Hana; I’ve never been to Hawaii but I have been to Costa Rica twice. 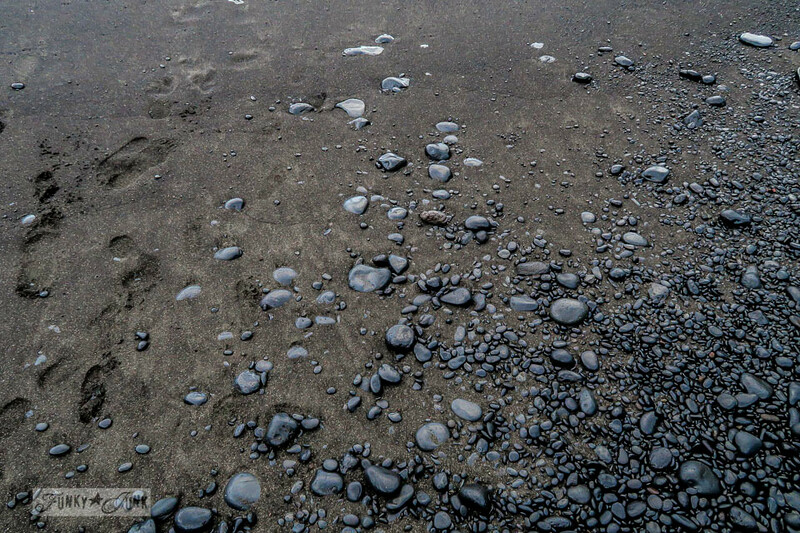 There are beaches there with black sand, too. And jungles and volcanoes. 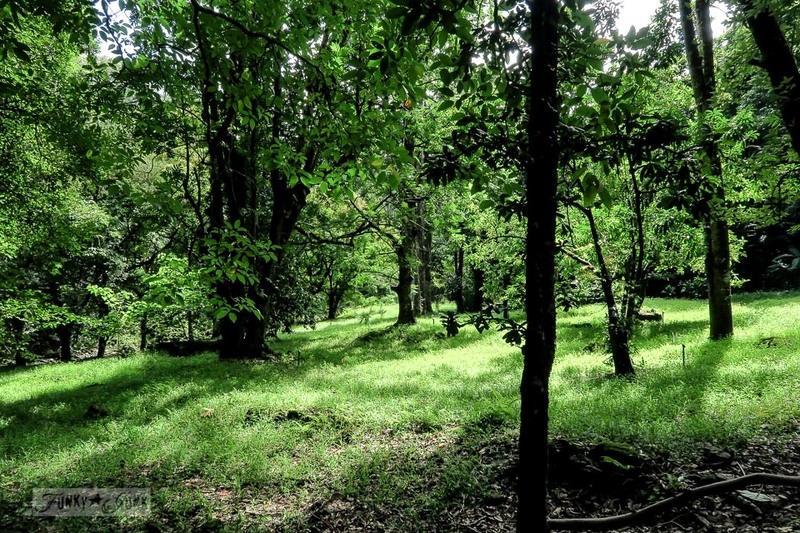 Your photos remind me of much of what I saw in Costa Rica. What a wonderful getaway you had it sounds like. And extra nice to get to do it with your sister. Will look for the next chapter! Charles Lindbergh’s Grave Site the end of a journey on the road to Hana was cool! 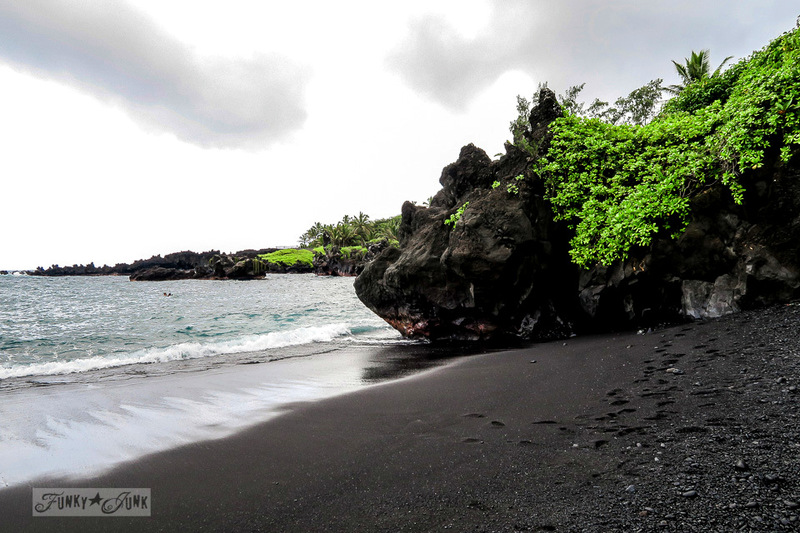 I also loved the black sand beach. We even frolicked in one of the pools of water under a waterfall!!! Loved it all. Thank you so much for sharing these wonderful pictures. I love Mother Nature, trees, water you got me. 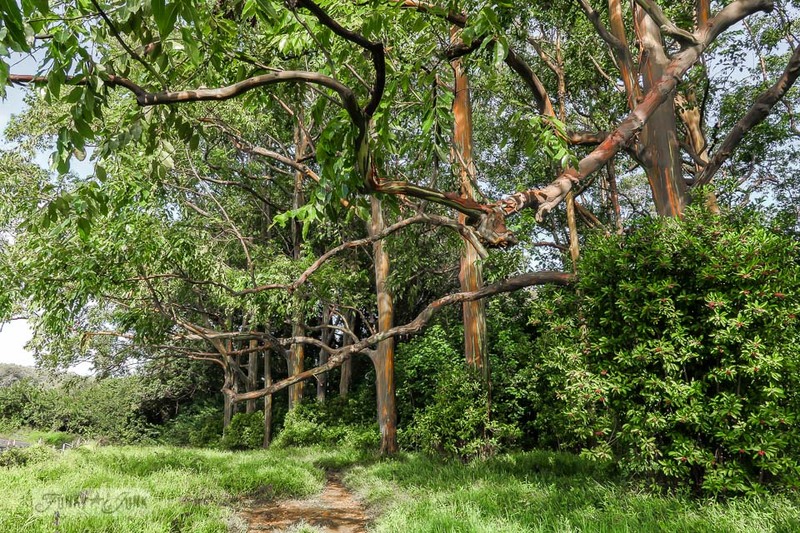 The trees, beautiful branches, wow! We also did this tour, in 2001, at that time the road was pretty bad, in fact the car rental company said we would not be covered in case of an accident. We ended up on a small bus. 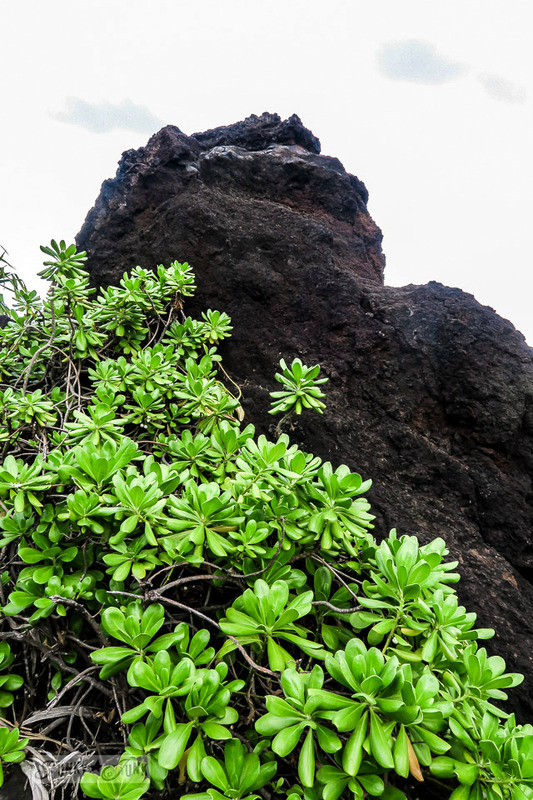 Our driver told us not to take sand or stones, because they were Pele’s children and we would have bad luck. Anyway it was a wonderful trip, with so much beauty. Next time we will follow your advice and book accommodation. Thank you for the beautiful pictures, they brought back many wonderful memories. 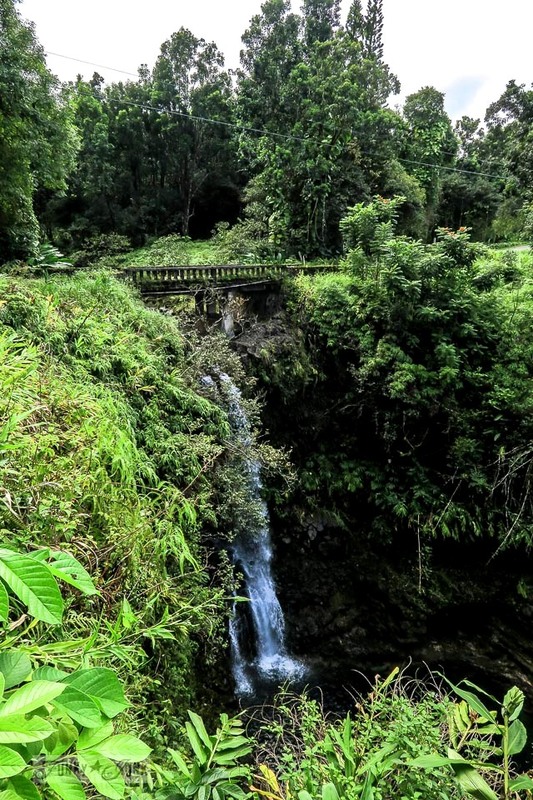 One of my trips to Hana Road included a hike through a bamboo forest to go see a spectacular waterfall. I was with MY SISTER (the one that is right about everything – giggle) and her family. We started down a very muddy trail into the forest. The further we went, the bamboo got thicker in diameter and forest and the trail got thinner and basically invisible. But, my sister had her trusty guide book that said, “Stay to the Left” of wherever we were going. We finally came to an opening near a stream. There at the end of a stream, in the side of a hill was our waterfall… a very large pipe with water gushing out of it. 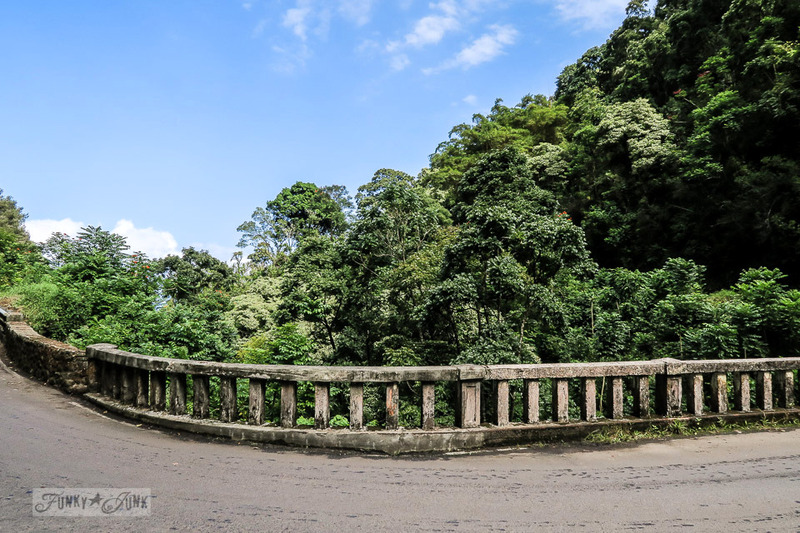 We, of course, all chimed in with, “Is THIS the waterfall?” At this point, we didn’t know where we were but felt like the clearing was our safest destination point rather than turning back into the bamboo forest with no trail to follow. So, we trekked on into the clearing which turned into a cow pasture and then we finally found the road again. The last part of the adventure was to climb over a cow gate to get to the road. Once we got over the gate and turned back to look at where we had come from we saw a huge sign on the gate that said, “NO TRESSPASSING!” Oops. 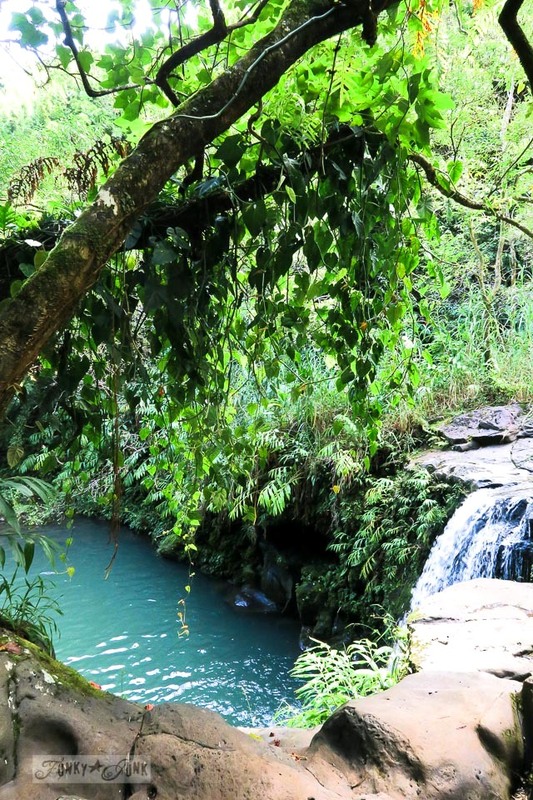 Needless to say, we never found the wonderful waterfall but the adventure is a priceless memory. And the phrase, “Stay to the left” often comes up when we find ourselves in similar situations of trying to find our bearings at places. Thanks for letting me relive Maui! Yes! 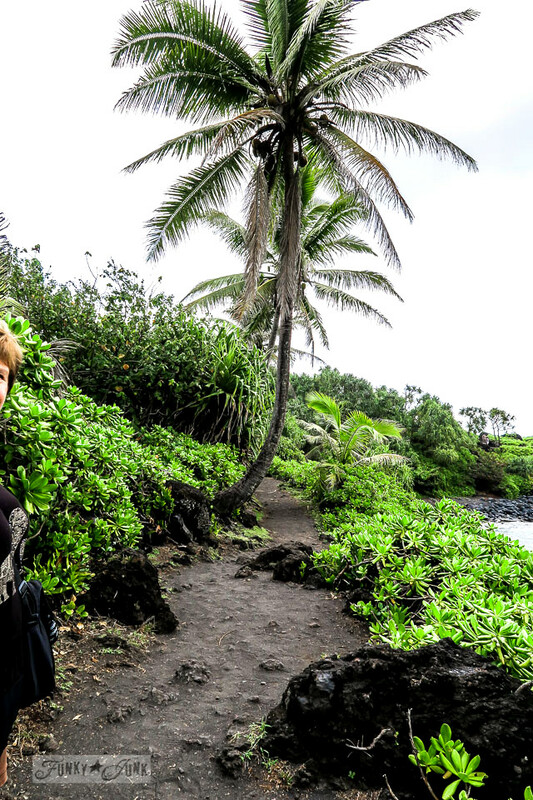 I have been to Hana. In 1999 I went to Maui with my Mom, 3 of my sisters, my sister-in-law and her mother. 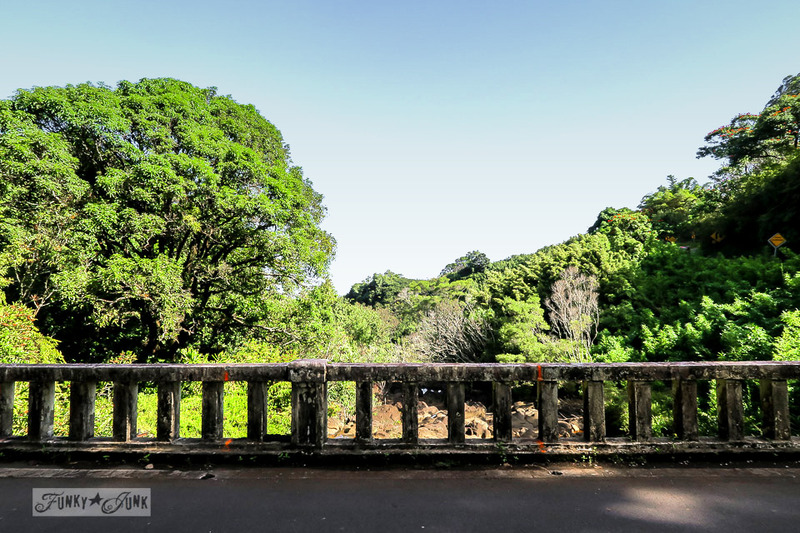 We went on a tour of the Road to Hana. It was a whirwind one-day trip. There was a small bus-full and the driver stopped at many of the key sites along the way. It was a loooonnnggg day – I think we left Lanai at 6 a.m. 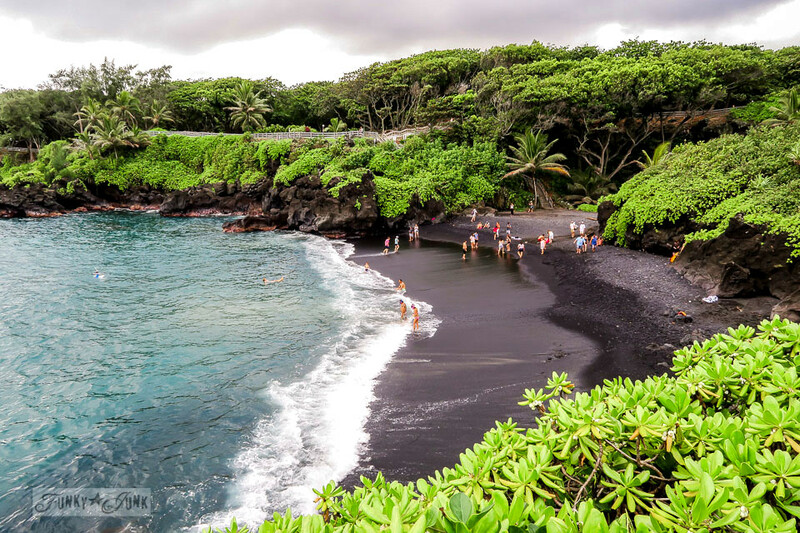 I do remember that awe-inspiring black sand beach. We stopped there for lunch. Would love to have spent a couple of nights along the way as you did. Great photos! They bring back a lot of memories for me – those hair-pin turns. 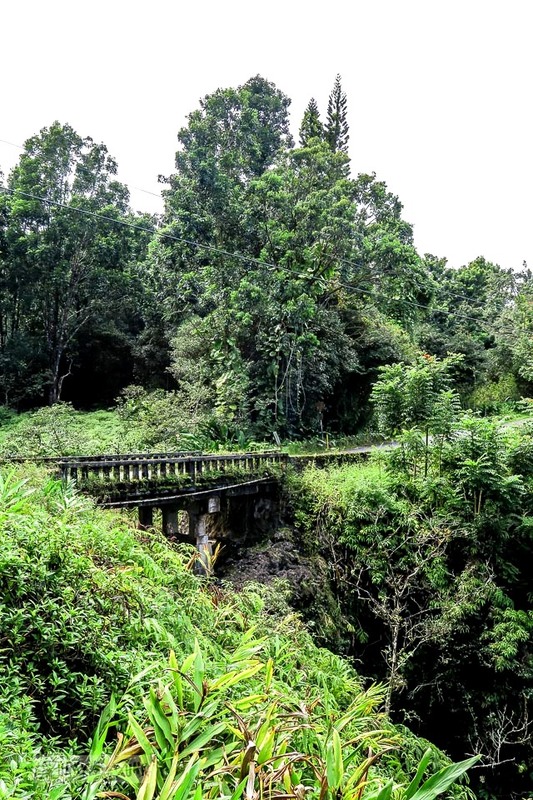 Somewhere, packed among my many mementos, I have a certficate proclaiming that I survived the Road to Hana. so excited I found this blog. My son and his wife went to Hawaii last year and stayed at the Entabeni cottage. My husband and I are now heading to Hawaii next May because our kids couldn’t stop raving about it. I booked the cottage last night. 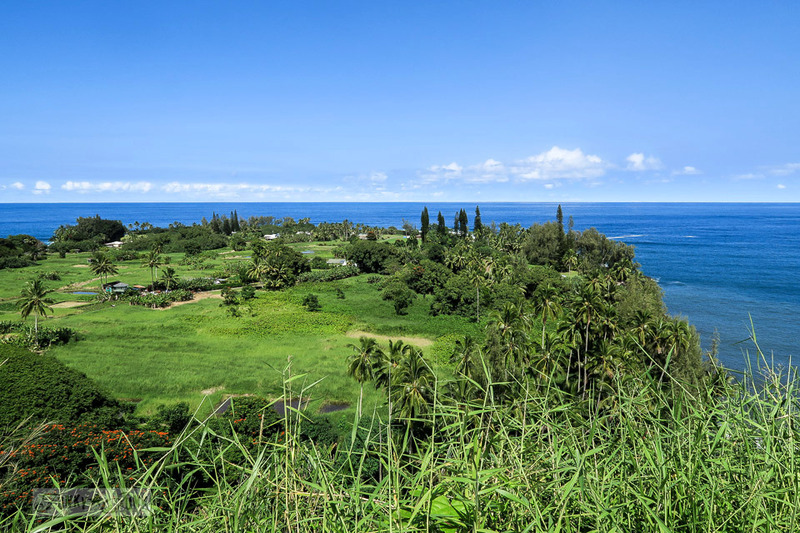 Loved seeing your day trips on the road to Hana so I could get a better appreciation of what to expect. Hey is the Black Sand beach after you get to Entabeni Cottage? We’re staying there too. I’m trying to plan our first day. You are correct! 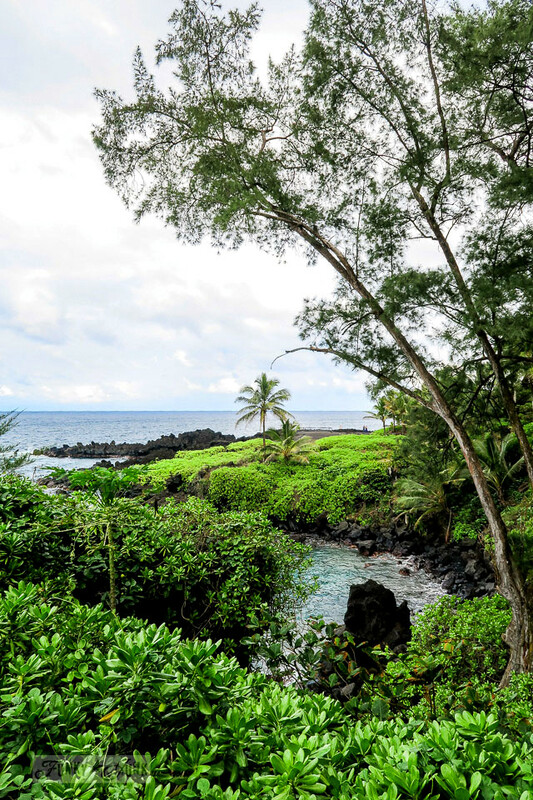 The cottage is about 10-15 minutes before the black sand beach. You’re gonna love both spots! I suggest to attempt to get there during daylight. The driveway into the cottage may be tricky to navigate otherwise. The driveway is cement tracks that are a little steep in areas.